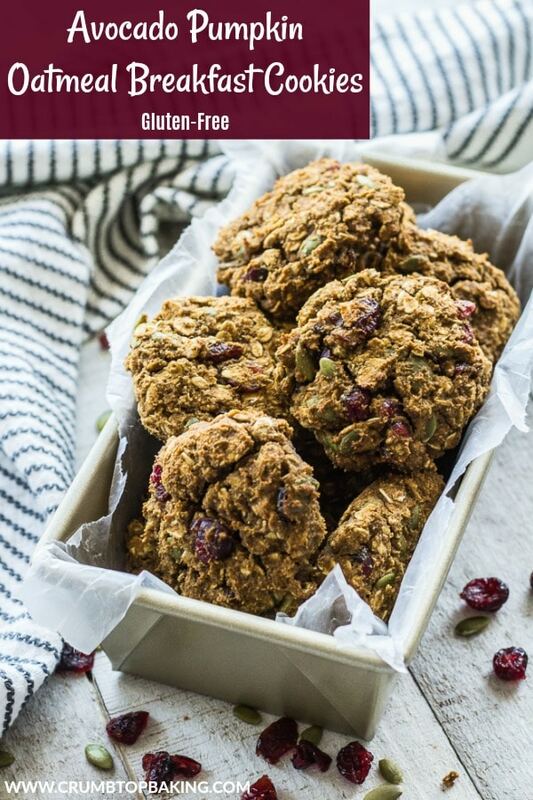 Avocado Pumpkin Oatmeal Breakfast Cookies are dairy and gluten-free, made with avocado instead of butter and oil, and loaded with lots of fibre and pumpkin spice. They make a filling breakfast for mornings when you want to eat your oatmeal on-the-go! So it’s post-Thanksgiving in Canada, and my mind is slowly turning to the holiday season. I know, seems a bit soon, right? I’ve always started holiday prep early, but since I started food blogging, my prep starts even earlier. There are just so many desserts and holiday dishes to whip up, so starting early is the only way I can share them all! Coming up on the blog soon, I’ll be sharing some holiday desserts, cookies and brunch dishes. But for now, I’ll try to keep it all things fall. And by all things fall, I mean all things pumpkin! 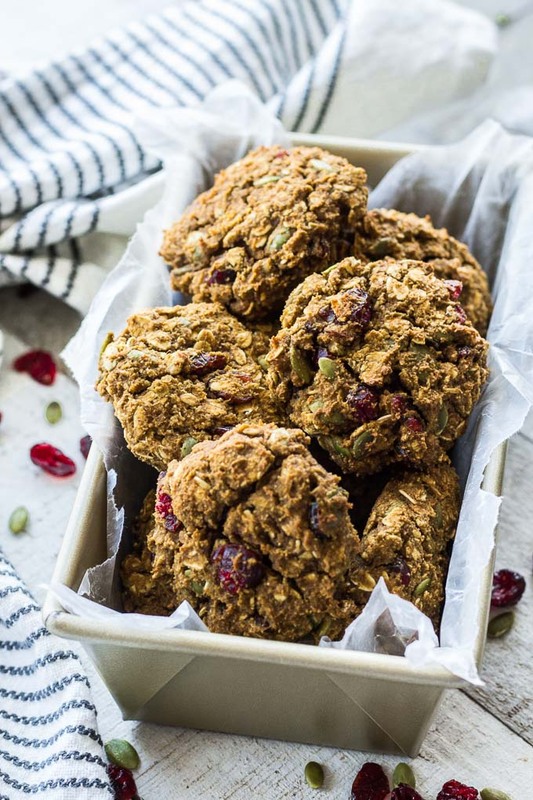 These Avocado Pumpkin Oatmeal Breakfast Cookies are hearty and wholesome, and conjure up images of cold fall mornings, curled up by the fire with a pumpkin spiced latte, enjoying some of these oatmeal cookies for breakfast. Of course, the more accurate image involves me bundled up in a winter coat and scarf, devouring a cookie or two as I head off to work with my coffee in a travel mug! While my cozy fall daydreams may not quite be reality, what is real is the smell that these cookies create as they are baking up in your oven. With the smell of pumpkin spiced oats and cranberries wafting through the kitchen, who needs a scented candle?! To keep these cookies gluten-free, make sure you use gluten-free oats. You can use fresh or frozen avocado chunks, but if using frozen, I suggest de-frosting them first (30-60 seconds in the microwave should do it). 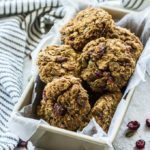 This recipe calls for dried cranberries and pumpkin seeds, but other dried fruit, nuts and chocolate chips would be great too. I always use a lighter coloured pan when baking cookies as darker pans tend to burn the bottoms of cookies more quickly. While these cookies were made in my blender, you could also prepare them in your food processor or electric mixer. Just be sure that whatever you use is powerful enough to blend together the ingredients. And remember to stir in the oats, cranberries and pumpkin seeds. Don’t blend them in! 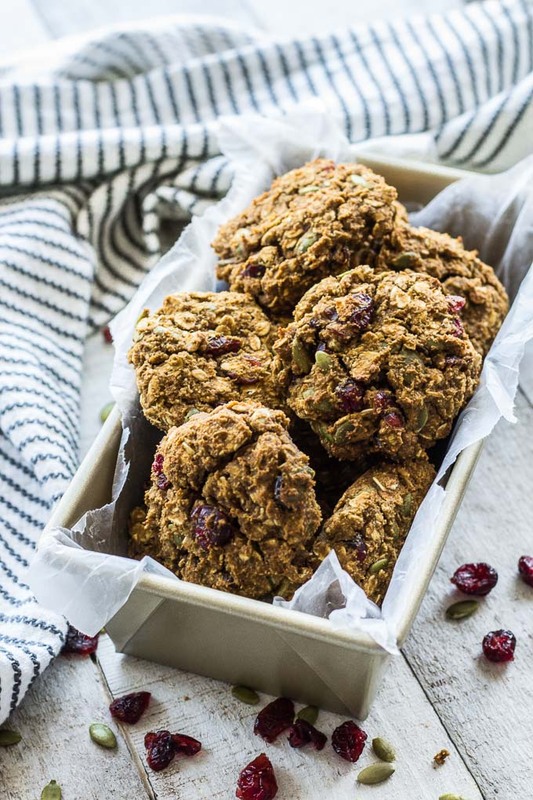 If you make these Avocado Pumpkin Oatmeal Breakfast Cookies, I would love to hear about it in the comments below. 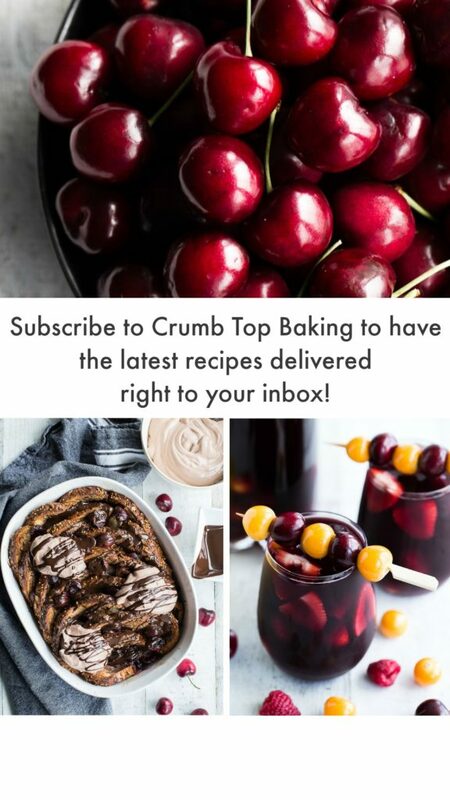 Or take a pic and share it on Instagram by tagging @crumbtopbaking. 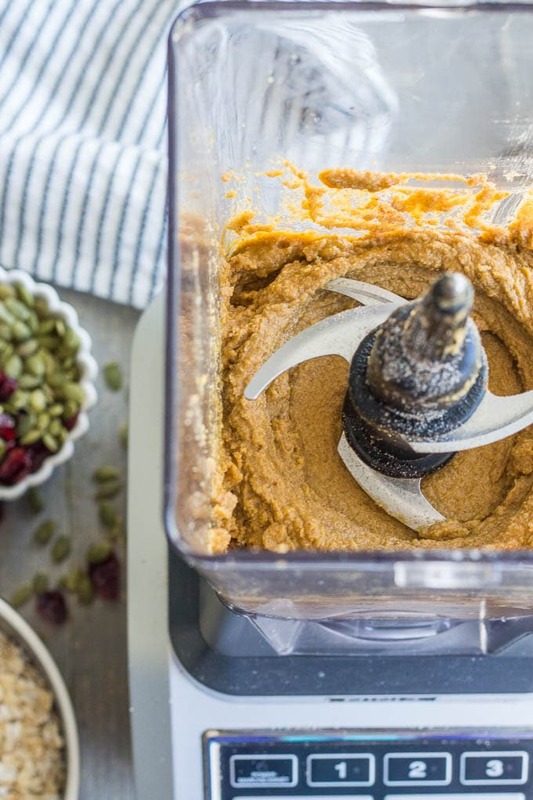 In a blender, add the avocado, pumpkin and sugar. Blend on high for 1-2 minutes until mixture is smooth. Add the eggs and vanilla and blend on high again until well combined. (About 30-60 seconds). In a small bowl, sift together the almond flour, pumpkin spice, baking soda and salt. Add to the wet mixture and blend until the dry mixture is fully incorporated. 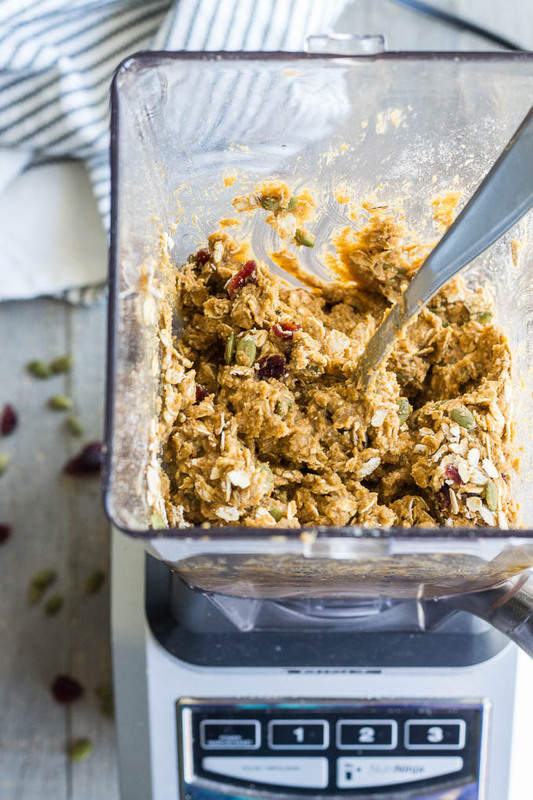 At this point, you can pour the batter into a large bowl and stir in the oats, cranberries and pumpkin seeds. But I usually remove my blender blade and just add these ingredients into the blender and stir them into the batter. Do not blend in these ingredients! Using your hands, shape the batter into 12 patties that are about 1-inch thick and 2.5-inches in diameter. Arrange the cookies on the baking sheet about 1/2-inch a part. The cookies will not rise or expand much as they bake. Bake for 20-22 minutes, or until the cookies start to brown on the edges. Remove from the oven and let cool on pan for 15 minutes, and then move to a wire rack to cool completely. Store in an airtight container on the counter and enjoy within 3-4 days, or store in the freezer for later enjoyment! I use frozen avocado chunks (President’s Choice brand) to make these cookies. (Not sponsored, just love the convenience of this product). I just defrost the chunks in the microwave for 30-60 seconds so they blend more easily with the other ingredients. You can also use fresh avocado. Thanks Victoria! I can’t wait to hear what you think if you make them. And I’d be curious to know if your little one likes them. Thanks for stopping by! It was a lovely holiday weekend! Thanks Patrick! I’m so intrigued by these Leanne! I’ve never baked with avocado before, mostly out of fear, and I need to get over it. I’m sure you can’t even taste it and that it works wonders in baking! I’d gladly smell the aroma of baking cookies over a scented candle too…I’m going to try these! Thanks Marcie! I was definitely skeptical of avocado at first. I use it in a creamy chocolate filling for desserts all the time, but using it in baking took some trial and error. But in the right proportion it works well as a substitute for oil or butter. And you definitely can’t taste it. Would love to know what you think if you try baking with it! These look so scrumptious! Love the avocado instead of oil. I’ll definitely be making these! Thanks Lisa! I hope you like them as much as I do! These look amazing Leanne! I am definitely gonna have to make them to bring to work with my pumpkin cappuccinos now that its fall! Hope your Wednesday is going well! Thanks Kendra! I like the way you think pairing these cookies with pumpkin cappuccinos! I hope you like the cookies! Keep me posted! I’m always up for cookies for breakfast Leanne! And these look deliciously satisfying! Thanks Mary Ann! Can’t go wrong with cookies for breakfast! I LOVE the sound of these, Leanne! Any time I can start my day with cookies I know the day will be good :). I can’t wait to see all the holiday treats you’re whipping up. Have a great weekend! Thanks Kelsie! Cookies for breakfast definitely means it’s going to be a great day! I can’t wait to start sharing holiday treats. This is the best time of year for baking! Happy almost Friday! Any day that starts with cookies has got to be a good day 😉 These look loaded with yummy ingredients and I bet are quite filling. Your morning out the door sounds a lot like mine, lol! I think we needed to bundle up extra warm this morning though! Brrrrrr!! Thanks Dawn! These are definitely filling cookies. You’d only need to eat one or two for sure. Mornings are so hectic and I never get out the door on time! And yes, this morning was cold. I think I actually need to break out my winter coat now! You’re a mind reader, Leanne! I have a bit of canned pumpkin leftover from the holidays and I was contemplating a breakfast cookie of some sort – ta da! You must have made these for me, right?! They look terrific! Haha! Thanks Katherine! Of course I made them with you in mind. I look out for my fellow breakfast lovers! If you lived closer I would definitely share. Happy almost weekend! These are delicious!! Great to grab on the way to work in the morning! Yum! Always looking for nutritious, gluten-free snacks and this recipe fits the bill! Avocado is sooooooo nutritious! Thanks– pinning to try soon. Thanks Elaine! 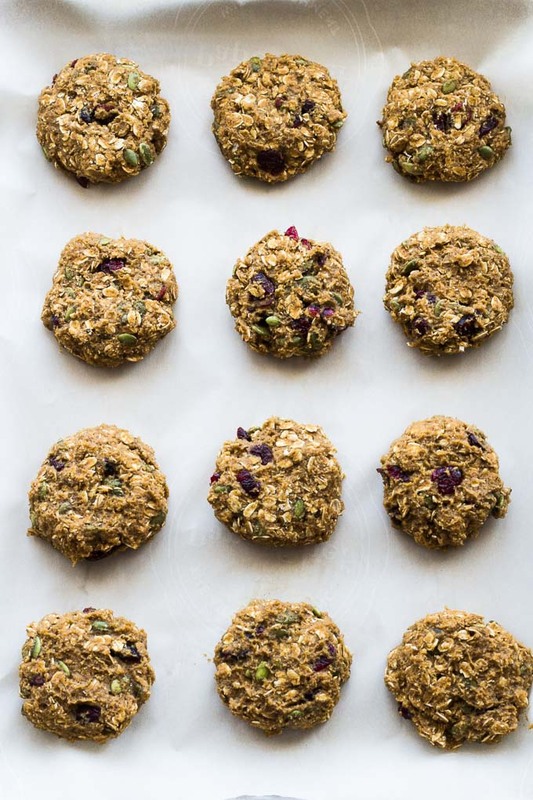 The avocado works really well in these cookies, and they’re definitely on the nutritious side! Thanks for pinning! I love using avocado as a replacement for butter, so this recipe is super exciting for me. 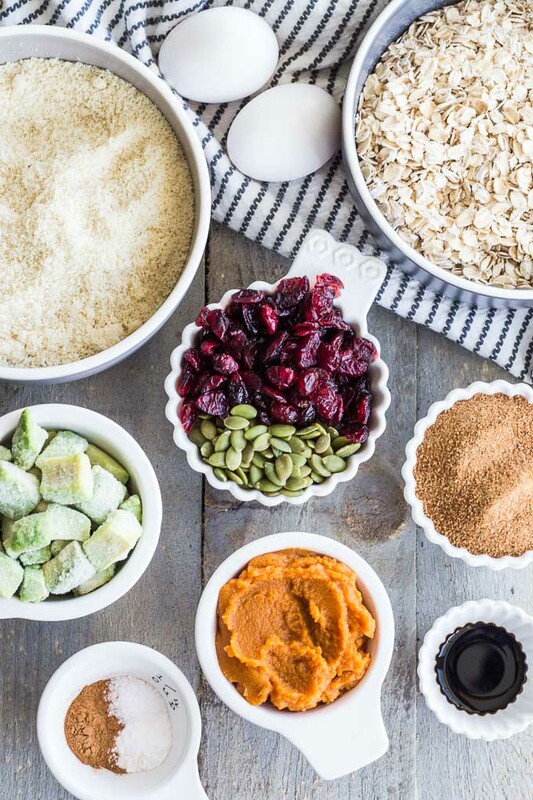 Do you have any replacement ideas for the almond flour? Thanks Corinna! I haven’t tested these cookies with any other type of flour, so I can’t say for sure how they would turn out, but you could try replacing the 1 cup of almond flour with whole wheat flour or a mix of whole wheat and buckwheat flour. Just note that the consistency may not be the same and the cookies may end up a little drier. I seriously cannot wait to try these Leanne! Love the idea of a breakfast cookie, especially one that has avocado in it! I bet it adds a great texture! And I need to try the frozen chunks as well, noted! Thanks Tanya! I can’t wait to hear what you think of them! And the frozen avocado chunks are super convenient. You definitely need to give them a try! Leanne, these are fantastic. I love Themis recipe so much, it’s heLthy, flavourful and the avocado – what and awesome addition! Thanks so much for sharing this with us. I can’t wait to make these, even my little Luna will get to indulge. Thanks Kristen! I’m so glad you like the recipe. I’d love to know what you think if you make it! Hope Luna likes them too! I love how healthy these are!And portable! I can only eat healthy sweet stuff in the morning, otherwise it’s too slippery a slope… so these are perfect! Thanks Terri! Portable snacks and breakfasts are the best! Hope you a great weekend!